Mobile communication and computing technologies are improving the accessibilty of knowledge and serving as an important new way of learning. This upcoming October a free, online "Mobiles for Development" course will take off, focussing especially on the concepts and practices in mobile technologies that are relevant to learning and education, agricultural extension and rural credit and finance. The course is open to any learner and will take 4 hours a week for a period of 6 weeks. Recognize frequently used terminology, and identify techniques and methods in mobile computing and communications that are relevant to development. Recount key use cases and successes, and recognize common policy requirements for the support of mobiles for development. 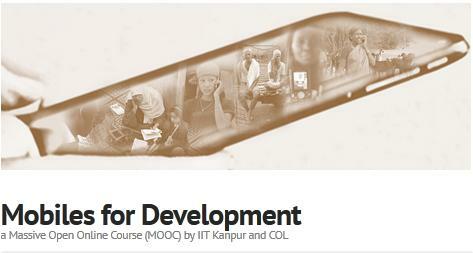 The course is organized by the Indian Institute of Technology (IIT) Kanpur - a premier research university that is pioneering a number of advances in mobile technologies and their applications - and the Commonwealth of Learning (COL), an inter-governmental organization that is globally known for its efforts and advocacy to improve access to learning at all levels.